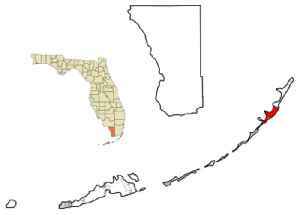 Key Largo is a census-designated place in Monroe County, Florida, United States, located on the island of Key Largo in the upper Florida Keys. The population was 10,433 at the 2010 census. The name comes from the Spanish Cayo Largo, or "long key". It is both the first island and town of the Florida Keys to be reached from the Overseas Highway to Key West. It was also the location of one of the stations of the Overseas Railroad.